The Aircraft Rescue and Fire Fighting (ARFF) community at large has expressed its collective appreciation to Airport Professional Services (APS), and especially to Gary Schott, for inventing the one-of-a-kind Penetration Aircraft Skin Trainer (PAST Trainer), and making it available at an affordable price to ARFF departments that have vehicles equipped with a High Reach Extendable Turret (HRET). 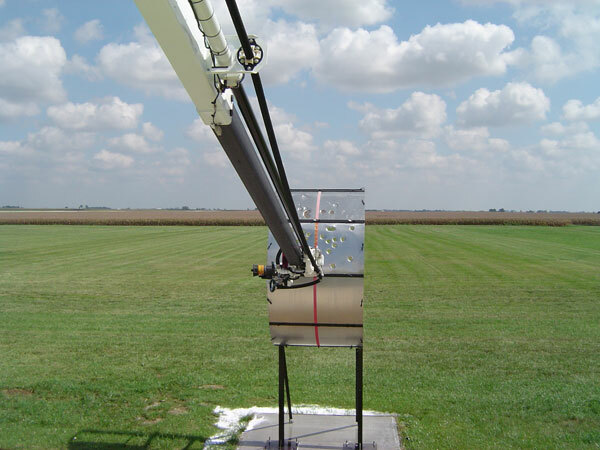 Gary designed an integrated training system comprised of the PAST Trainer, the replaceable aircraft-grade aluminum penetration panels, and the Foundation Anchor System, which together provide a very realistic penetration training experience. We proudly manufacture the PAST Trainer and all associated products in Nebraska, USA. We have kept the price of the PAST Trainer, the Foundation Anchor System (FAS), and the aircraft-grade aluminum panels affordable to ARFF departments in spite of the ever-increasing cost of the steel, aluminum, and rebar we use in manufacturing them, as well as the materials used to prepare Trainers and panels for shipment (cardboard boxes, Styrofoam inserts, and wood for the pallets that we manufacture to hold replacement panels, and the wood we use as a temporary platform to support the spare panels we attach to the PAST Trainer for shipment). Professionals who use the PAST Trainer have expressed how valuable it is as a penetration training aid. The Federal Aviation Administration (FAA) bought a PAST Trainer for use in their research and development projects, and recommends that airports use the Trainer for hands-on HRET training and certification. Airport managers also appreciate the PAST Trainer because its shape and its powder coated surface makes it pleasing to the eye compared to previously used alternatives. Some observers have actually mistaken the PAST Trainer for a metal art sculpture. 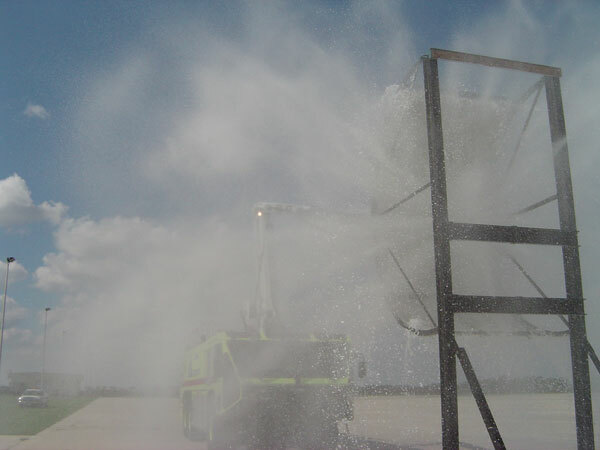 With the PAST Trainer ARFF crews have a superb opportunity to hone their penetration skills and increase their fuselage penetration self-confidence. The curvature and height of the PAST Trainer are designed to simulate the fuselage of large passenger and cargo aircraft. The PAST Trainer is constructed of a heavy gauge steel framework with low-cost, easily replaceable aviation-grade aluminum panels. It is fully welded then powder coated in one piece for delivery. The powder coating helps to prevent corrosion, and it also produces an aesthetically-pleasing metal Trainer that airport managers appreciate. 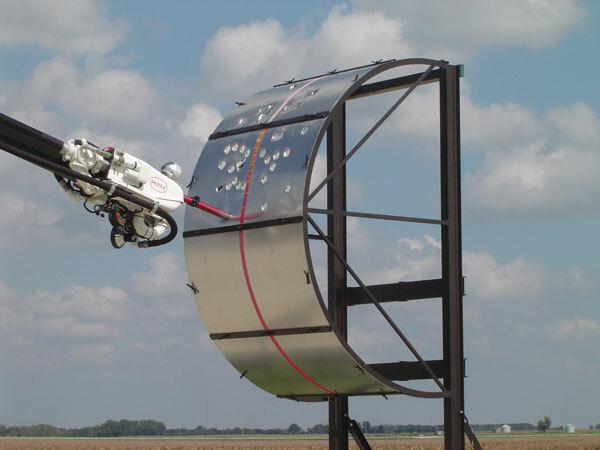 The curved, aircraft-grade aluminum panels provide resistance and piercing action similar to an aircraft fuselage thereby producing very realistic HRET penetration training. PAST Trainer Hands-On HRET Penetration Training System. 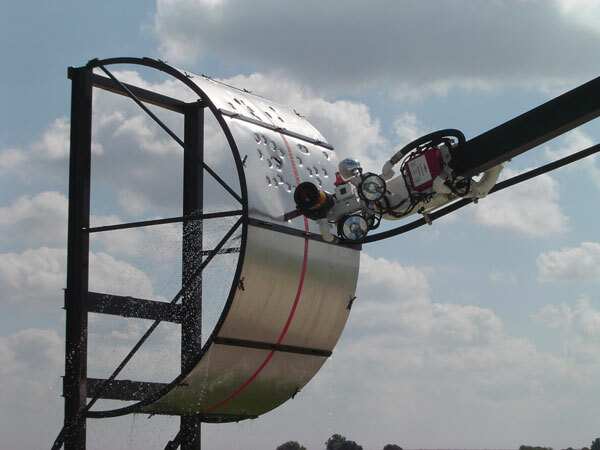 The PAST Trainer is a patented hands-on HRET penetration system that includes replaceable aircraft fuselage-grade aluminum penetration panels and the Foundation Anchor System (FAS). Each of these elements was specifically designed as an integral part of the PAST Trainer High Reach Extendable Turret (HRET) Fuselage Penetration Training System. APS spent much time, effort and money perfecting all of these elements through repeated design, development, and testing over the period of several years. The PAST Trainer is the only hands-on HRET training device on the market. We designed the aircraft-grade aluminum penetration panels to provide a very realistic HRET penetration training experience, as explained in more detail below. Also, we designed the Foundation Anchor System to add strength and adhesion to the concrete foundation, and to make the PAST Trainer installation easier and more precise, also explained further below. Penetration Aircraft Skin Trainer (PAST Trainer). 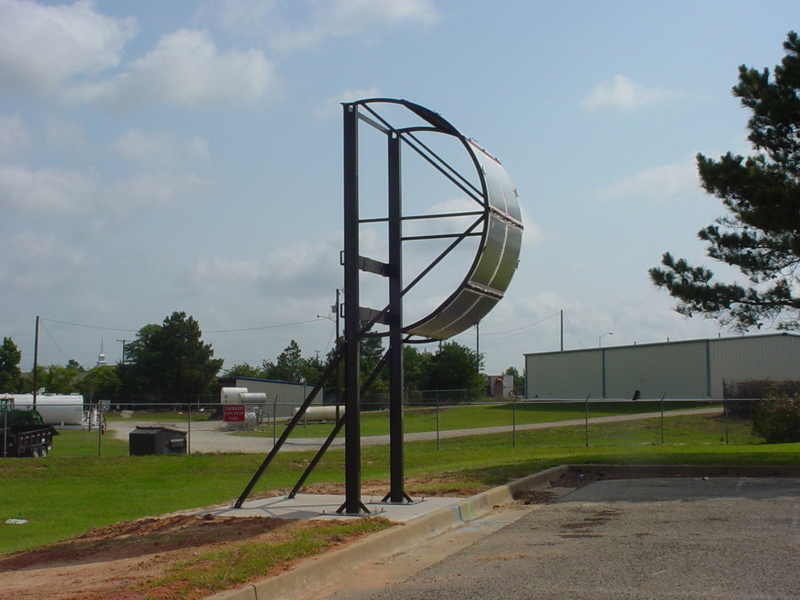 The PAST Trainer is approximately 16 feet high, is made of heavy-gauge steel, is completely welded, and then is powder coated all in one piece in a very large powder-coating oven. The coating adds thickness, durability, and beauty to the exterior surface. 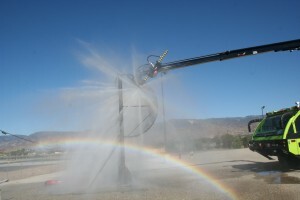 The Trainer weighs almost 1,000 pounds, and is delivered fully assembled except for the two rear stands that are easily and quickly attached during installation. The rear stands attachment to the back of the I-beams have a designed-in adjustability to accommodate any unevenness of the surface of the concrete foundation. The PAST Trainer is delivered with four aircraft fuselage-grade aluminum penetration panels installed. Many hardware pieces are stainless steel, which along with the powder coating, minimize the formation of rust and corrosion resulting in a Trainer that is essentially maintenance free. 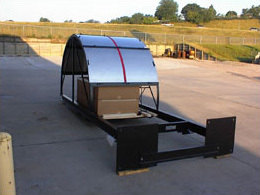 The weight of the shipment will range from 1,100 to 1,800 pounds depending on how many sets of spare aluminum panels you order. You will need a minimum 6,000 pound forklift on hand to safely offload the PAST Trainer upon delivery. It is shipped as one item; is shipped on its back; and its shipping dimensions are 191” Long x 81” Wide x 72” High. This photo shows the PAST Trainer on its back, which is the way we ship it. The forklift attachments in the base of the Trainer are visible in this photo. Replaceable Aluminum Penetration Panels. The PAST Trainer is delivered with a set of four replaceable aircraft fuselage-grade aluminum panels installed on the curved penetration structure. The four panels are a full covering of the penetration structure. There are three reason the panels are pre-installed: 1) to protect the underlying penetration structure during shipment, 2) so the ARFF crew can see how the panels fit on the curved structure, and 3) training can begin on the PAST Trainer immediately after it is installed on the foundation. The easily replaceable panels provide an ideal, realistic, hands-on HRET fuselage penetration training experience. 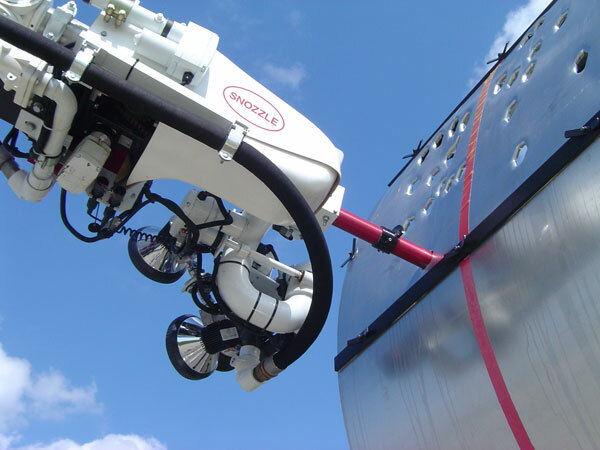 The panels are curved to fit the penetration structure precisely; they are notched at both ends; and they have high quality and highly visible tape placed strategically on the outer surface of the panels to show HRET operators where not to penetrate. The positioning of the tape is designed to prevent damage both to the underlying penetration structure and to your HRET penetration tip. Also, the panels’ precise fit on the penetration grid provides a tightness that significantly reduces friction, drag, and buckling during proper penetration and extraction. We clean the panel surface to ensure optimum tape adhesion, and we smooth the panel edges to make them as safe to handle as possible. Ordering multiple spare sets of panels to be delivered with the PAST Trainer saves shipping costs because the shipping price remains the same on up to eight spare sets of panels that are delivered secured to the PAST Trainer. 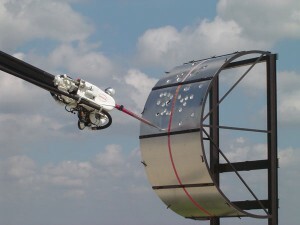 A maximum of eight sets of panels may be delivered with the Trainer without increasing the shipping and handling price. The reason for this we are charged by the volume, not the weight, and we can secure up to eight sets of panels within the Trainer’s I-beams for shipment. Also, up to four more sets of panels may be ordered to be delivered on the same freight truck as the Trainer and, although they will have a separate S&H price, that price will be lower than if ordered as replacements separately at a later date. NOTE: APS’ policy regarding replacement panels for overseas owners of the PAST Trainer is as follows: All elements of the PAST Trainer Hands-On HRET Penetration Training System are patented–including the aluminum penetration panels on which APS spent much time, money, and effort perfecting the panel to enable it to provide an ideal and realistic HRET penetration training experience. As such, PAST Trainer owners in North America must purchase replacement panels from APS. However, APS realizes it would be cost prohibitive for overseas owners to have panels shipped from APS in Nebraska, USA to overseas locations. Therefore, after APS delivers the PAST Trainer, we will provide the panel specifications to the owner thus enabling them to have a local fabricator replicate and manufacture the panels in their desired quantity and frequency. However, APS requires overseas owners to promise not to share the panel specs with anyone in North America. 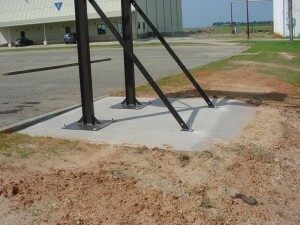 Foundation Anchor System (FAS). The patented Foundation Anchor System (FAS) is a must-have, welded, heavy-duty steel rebar structure with integrated anchor bolts. 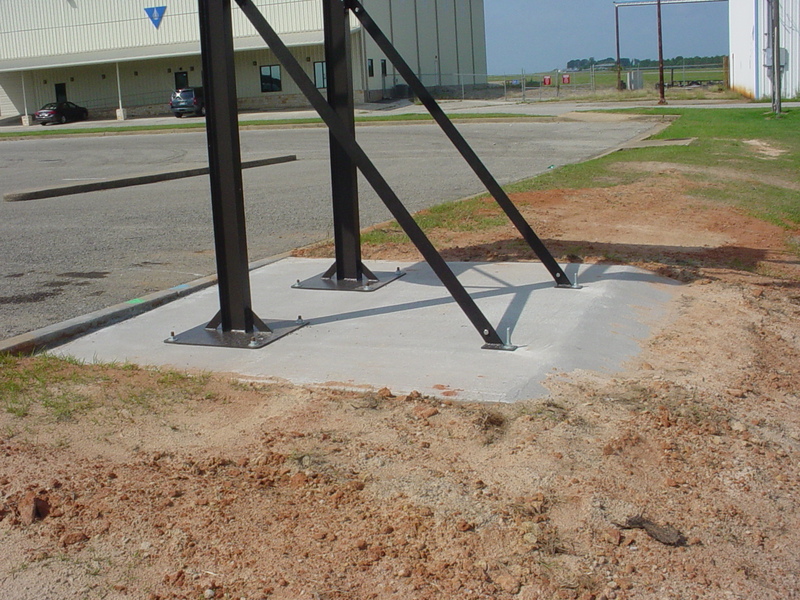 The FAS is an integral part of the PAST Trainer System, and we would include it with the Trainer but for the fact that some ARFF departments already have a concrete pad on which to install their PAST Trainer, so instead we offer it as an option for those who need it. The FAS is placed into the foundation while the concrete is curing. When cured, the eight anchor bolts that protrude above the concrete pad will mate with the eight holes in the base of the PAST Trainer. 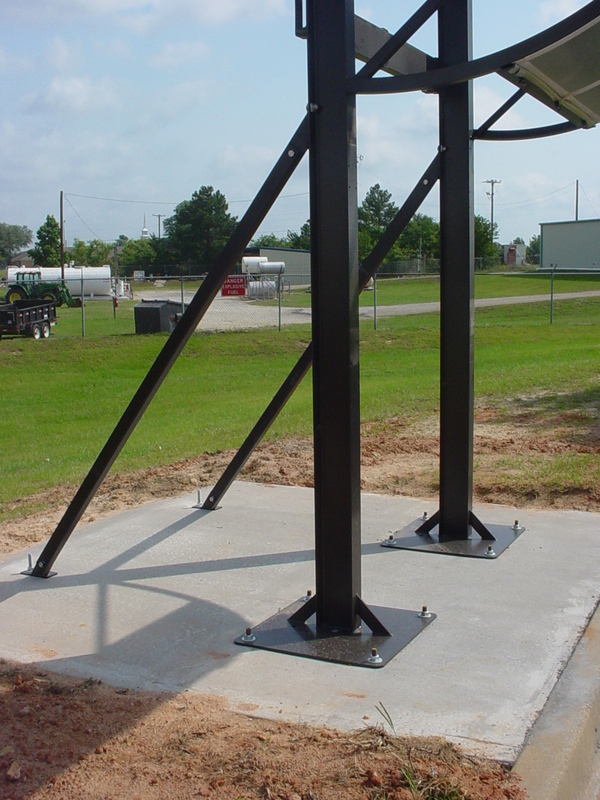 This facilitates the accurate and secure installation of the PAST Trainer on its foundation. However, if you will be installing the PAST Trainer on an existing concrete slab, you will not need the FAS, that is, unless you think you might need to relocate the Trainer in the future. If you do not order the FAS, we will provide all of the necessary anchor bolts, stainless steel washers and nuts at no additional charge. Important Note: We manufacture Trainers and FAS’s at the same time, and we make certain each FAS is matched with the Trainer before shipment; that is, we confirm the vertical anchor bolts mate precisely with the holes in the PAST Trainer’s base. Because of this, we are not able to sell an FAS to you after we ship your Trainer, unless you order one immediately after delivery, because we cannot guarantee it will match your Trainer. We keep matching FAS’s on hand for only a very short time after shipment. The photo immediately below shows the FAS. PAST Trainer Installation. Along with our delivery of a Trainer, we provide a PAST Trainer Installation Guide that includes comprehensive guidance on determining the size of the concrete pad to be used as the foundation, constructing the foundation, using the Foundation Anchor System or separate anchor bolts (if the FAS is not ordered), and installing the PAST Trainer on the foundation. We provide more detailed information on this Guide below. 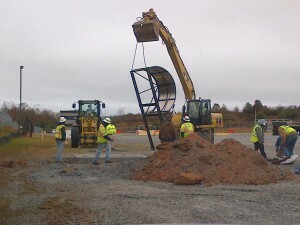 The photo immediately above shows a PAST Trainer installed on a newly constructed foundation. The first photo below shows a PAST Trainer being lowered onto its newly constructed foundation for installation. 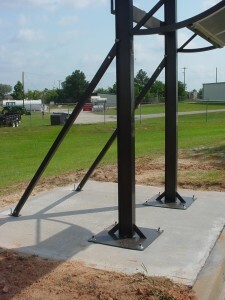 The two photos below that show a Trainer installed on its foundation. Sole Source Certification. Airport Professional Services, LLC (APS), certifies that we are the only source for purchase of the PAST Trainer Hands-On HRET Penetration Training System, consisting of the Penetration Aircraft Skin Trainer (PAST Trainer), replaceable aircraft fuselage grade aluminum panels, and the Foundation Anchor System (FAS). We proudly manufacture all of our products in Nebraska, USA; we own the patents on the PAST Trainer and all associated equipment (Patent Number US 7,527,499); all elements of this Training System are manufactured in the USA; we are the only manufacturer and seller of the PAST Trainer; and we deliver the PAST Trainer directly to the end user. Alternative PAST Trainer Purchasing Options. The PAST Trainer may be purchased using FAA Airport Improvement Program (AIP) funds, which can fund up to 75% of the price of the Trainer. 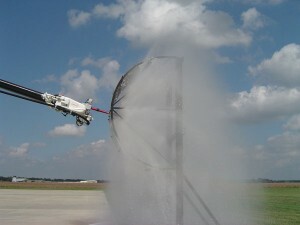 The FAA purchased a PAST Trainer for its use in fire safety research and development. 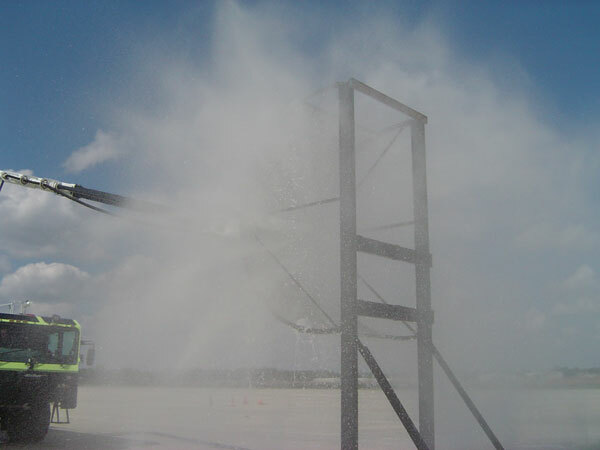 Thereafter, the FAA approved the PAST Trainer for acquisition funding through its Airport Improvement Program (AIP) funding in FAA Advisory Circular 159/5210-23, Subject: ARFF vehicle & HRET Operation, Training and Qualification. Also, FAA CERTALERT 0807, dated 7-18-2008, Subject: Guidance on the HRET, features a photo of the PAST Trainer, and specifically recommends it for hands-on HRET penetration training and certification. 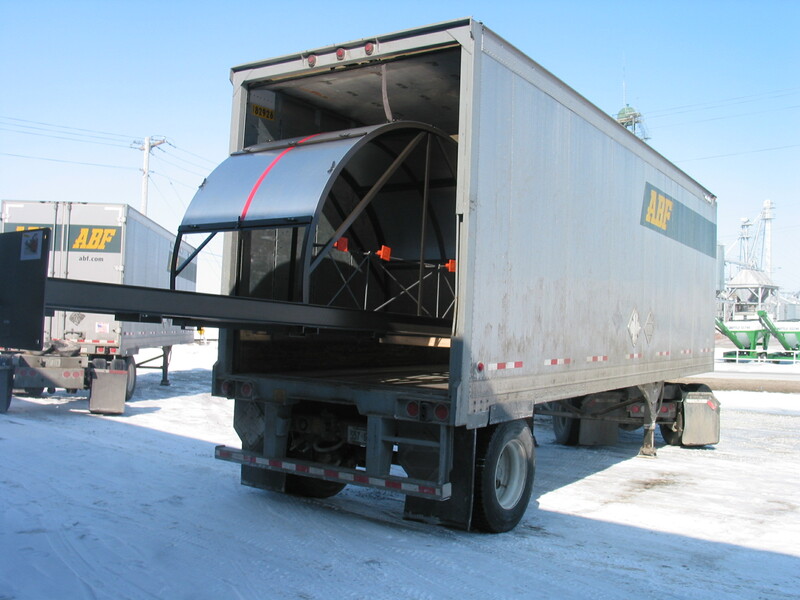 Many ARFF departments have purchased and continue to purchase the PAST Trainer by specifying its delivery in contacts for the manufacture and purchase of new ARFF vehicles–both HRET-equipped, and non HRET-equipped vehicles. This usually includes FAA AIP funding support. Multiple PAST Trainer Buying Trend. There is a growing trend of large airports purchasing more than one PAST Trainer and locating them at each of their ARFF stations. For instance, the Houston Airport System purchased four Trainers, and several other airports bought two Trainers. Also, other large airports that have purchased one Trainer have indicated that they are planning to purchase an additional Trainer. See our Deliveries web page for a listing of airports that have bought the PAST Trainer, including those that have purchased more than one PAST Trainer (note the number in parenthesis after the name of the airport). The photo below shows two freight trailers being loaded with Trainers that are both to be delivered to the San Francisco International Airport. PAST Trainer Hands-On HRET Penetration Training Guide. This comprehensive Penetration Training Guide is provided, at no additional charge, at the time we deliver your PAST Trainer. It provides guidance on utilization of the PAST Trainer, penetration training, evaluation, safety, and maintenance. It also includes guidance on methods to conserve panel surface for the purpose of making them last longer before replacements are needed. We ask Trainer owners to give us feedback to let us know of any penetration training methods and procedures they utilize that are not in the Training Guide. When we receive sufficient new training information we publish a revised Guide, and distribute it by email to all PAST Trainer owners. This enables each Trainer user to benefit from the collective HRET fuselage penetration training experience of many other Trainer users. We have revised and distributed a Training Guide many times. PAST Trainer Installation Guide. This Installation Guide is provided, at no additional charge, upon delivery of your PAST Trainer. It provides considerable guidance on installing the PAST Trainer either on a newly constructed concrete foundation with and without the use of the Foundation Anchor System, and on an existing concrete slab that is to be used as the foundation. It includes guidance on the required specifications of a newly constructed foundation (size, depth, etc. ), and how to install the Trainer on the foundation—new or existing. We receive feedback from Trainer owners on their installation experience, and we add that information to the Installation Guide for the benefit of future Trainer buyers.